I hope that you had a really good week and that you're ready for the weekend as much as I am. I love Fridays! :) I'm signing off now but remember that Monday is our BIG DAY as it kicks off two full weeks of decor8 discounts so please remember to stop by each day between November 3-14 to view the stores offering deals just for you. Note: All discounts will be valid from the time that they post until November 21, 2008. 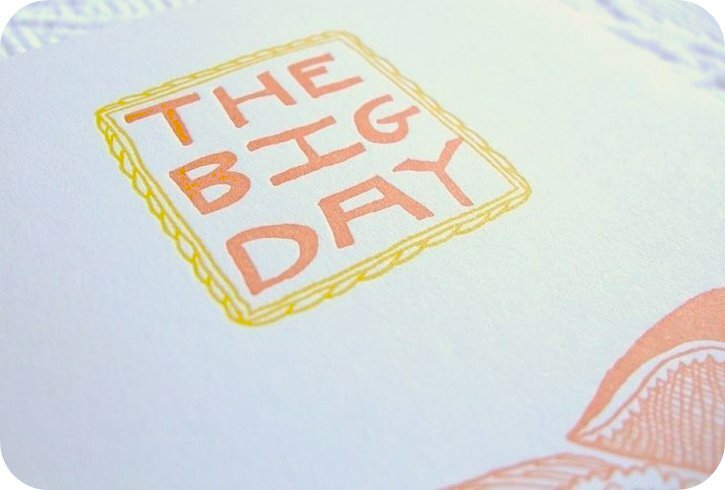 "The Big Day" by Sycamore Press. What are your plans this weekend? One highlight of mine: I'm meeting a group of ladies first thing in the morning for coffee and then we're off to the fabric market! Yay! If you are local and want to join us, please email me and I'll fill you in on the details. Here's the rest of my agenda: If you'd like to tell me yours, please comment below and on Monday you can comment again to report in on your progress. Saturday: Girls breakfast and then we hit the Holland fabric market (Stoffmarkt). Buy fresh flowers (I forgot to do this today). Finish painting my dining room chairs, reupholster them, bake cookies, and relax for the evening as I think this weekend will mostly be about reading, relaxing, and baking. Get crafty: Make a few necklaces while I watch a movie. Write a letter to my mother. Sunday: Talk a long walk in the forest with my man, collect pine branches, go shopping (special shopping day this Sunday where stores will be open and there's a festival downtown with food and such), spend time with friends in the afternoon, and at night... bubble bath! Every woman should end the weekend with a bit of pampering, don't you think? What will you do this weekend? Your plans?